The Hero’s Welcome | Home Cooks Unite! 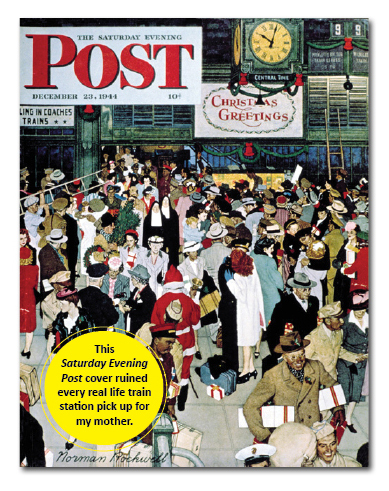 My mother grew up reading the Saturday Evening Post and had very romantic notions of what travel should be. She pictured every Amtrak station to be a hive of sentimental activity, like soldiers dramatically kissing their wives when coming home on leave or neatly dressed women returning from tea in the city. My mom didn’t get to travel much as a kid, so she relied on Norman Rockwell to fill in the gaps. Despite her disappointment, she still performed what I like to call the Hero’s Welcome. Every time she’d pick me up, she’d have either a bouquet of flowers or she’d take me out to lunch. My husband and I had gone to Paris when we lived in Philadelphia, and my mother picked us up at the airport when we returned. This was back when friends or relatives could meet you at the gate. I remember her standing behind the velvet rope, the only one with a huge bouquet of flowers and waving wildly. My husband was shocked. Every year, my husband takes our daughter up to Delaware to visit his family and go to the beach. The week they’re gone I stay up later than I should, leave dishes in the sink and watch cooking shows in my underwear. In other words, I miss them terribly. When they return, I want them to know how happy I am to see them. 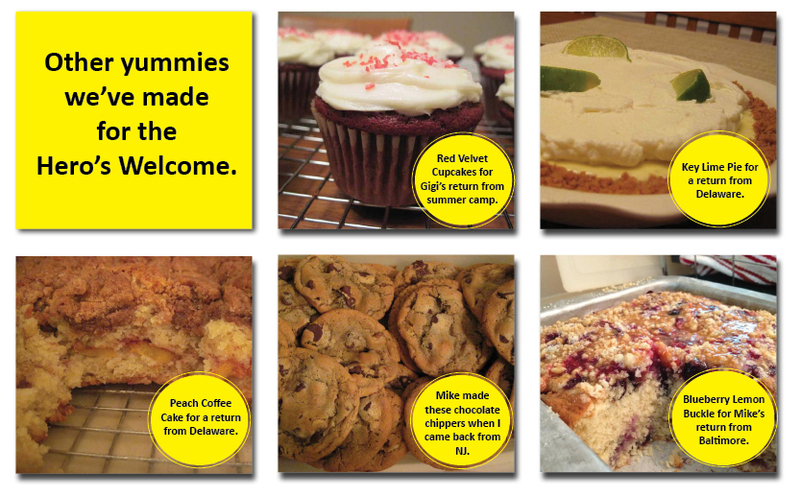 I clean up the house, make a welcome home sign to greet them with at the airport and I usually bake them something. The Hero’s Welcome. This year, I asked my husband what he’d like when they got back. 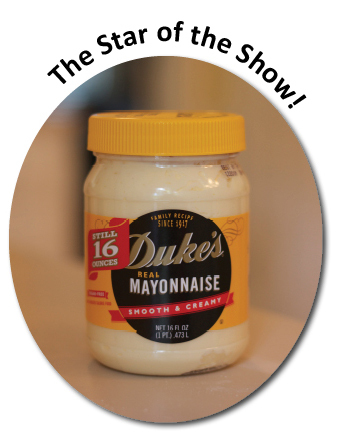 He said, “How about that Duke’s mayonnaise cake?” Duke’s has been running a commercial with the most gorgeous chocolate cake. Every time it comes on, we all mention how much we’d like to try it. 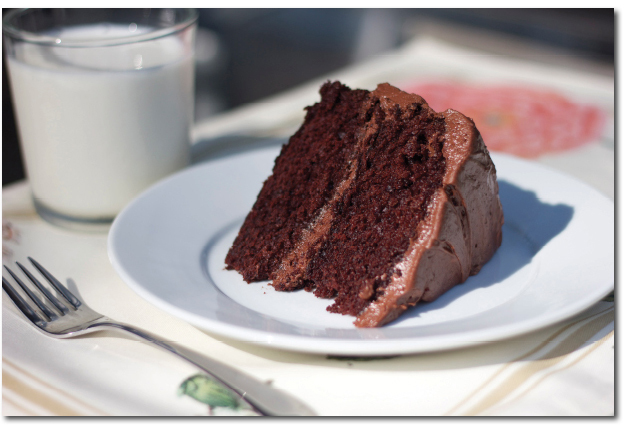 So, this year I made it, and it was hands down the best chocolate cake I’ve ever made! So rich and moist. They loved it, and I hope it made them feel welcome. Try it the next time one of your family members comes home! This recipe is from dukesmayo.com. So, so delicious! Preheat the oven to 350 degrees, grease and flour two 8-inch cake pans (I also line them with parchment paper). Sift cocoa, flour, baking soda, salt and sugar into a medium bowl, mix well. Combine mayonnaise, vanilla and water in an electric mixer at low speed. Once smooth, slowly add in dry mixture until just incorporated (do not over heat). Pour batter into cake pans and bake for 30 minutes or until done. Cool on wire racks. In the bowl of an electric mixer, beat butter and cocoa with whisk attachment until smooth. Add vanilla. 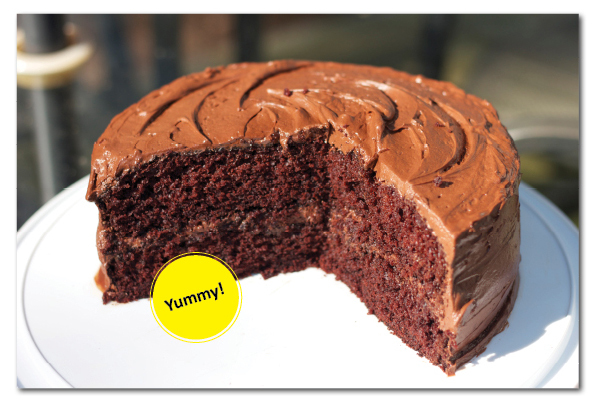 Add confectioners’ sugar alternately with milk until icing reaches a spreadable consistency. You may not need all 6 cups of sugar; you may need more than 6 tablespoons of milk. Thanks for the touching story about your mom. I always wait at airports with a flower or a balloon or something to create that Norman Rockwell picture! Who would have guessed. that looks delicious! I have to make it. Love the post. Your poor mom! This was awesome. I loved reading your story. You’ve got a follower in me. And feel free to come by with the paddle next time Gigi is out of town. I love this story! I’m going to start doing the welcome thing. Yum to the cake too. What a sweet post! My father always met me and my girls at the airport when we flew to CT at Christmas time. He was always at the gate wearing a red Santa hat. Now, whenever we meet anyone coming home for Christmas we haul out the Santa hats for The Welcome! The cake looks amazing. Such a nice story, and such a gorgeous looking cake! Can’t wait to try it. That frosting looks to die for! 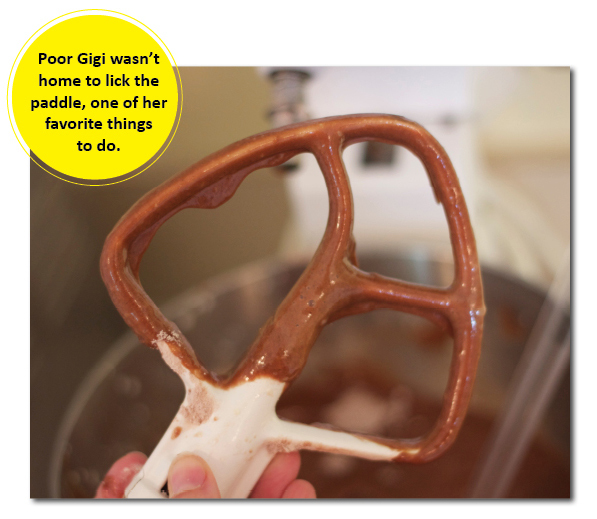 The bowl, the KitchenAid paddle, the rubber spatula… it’s all good!